Well folks, I made it 19 days and then opted to choose social engagement and a night cooking with my husband instead of complying with Whole30 rules. Could I have chosen water at the MBA School happy hour instead on Friday? Yes. But they were serving a really good Pittsburgh IPA and I wanted to enjoy a beer with my friends. That night, Alex and I cooked a London Broil for dinner and he used butter instead of ghee and tossed in some flour to thicken up the sauce into a gravy. And I have no regrets or disappointments about not ‘lasting’ the 30 days. Of the past 6 months, this recent Friday and Saturday were the first days that actually felt like a ‘normal’ weekend. I closed my computer at 6 p.m. on Friday and met Alex and friends at school for happy hour. We came home to cook dinner together which we haven’t done in months. On Saturday morning, we slept in and woke up with nothing on his agenda until 3p. Usually, Alex has school commitments all weekend long and I’m left to my own devices so to have a Saturday morning together with neither of us stressing about needing to be somewhere or do something? Such a treat! With a beautiful blue skied morning on Saturday, we drove down to the Strip District for brunch and wandering. While I ate as Whole30 as possible at brunch, I chose to not make a huge deal out of not being 100% compliant. Maybe/probably they cooked my eggs in butter or a non-compliant oil. YOLO. I debated most of Friday about how I would handle the happy hour – should I even go? I wanted to be compliant because the book says to do 30 days and I hate breaking rules. But I also wanted to enjoy a beer with my husband and friends. It would have been easy to just skip the happy hour and make a fuss about butter/flour at dinner but it was such a nice evening that I didn’t even care. Emotional well being > completing 30 days of compliant eating, in my book. So it may have only been 19 days but I do feel like I’ve gotten the benefit of Whole30. I feel great. I’m eating more fruits and veggies. I’m drinking lots of water and tea. 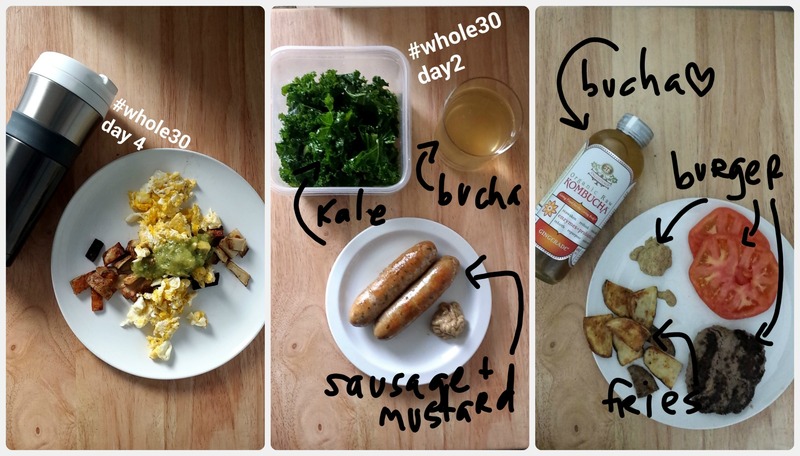 I didn’t break Whole30 because I couldn’t do it; earlier, I wanted to quit because I was bored and tired in prepping/cooking my food. If I’d stopped then, THAT would have felt like quitting. But this? This doesn’t. This feels like an adult choice of moderation. I went into this as a learning opportunity. I’m not a person who craves sweets or binges on bad-for-me foods so I wasn’t expecting for Whole30 to cure me or radically change my thoughts on food. 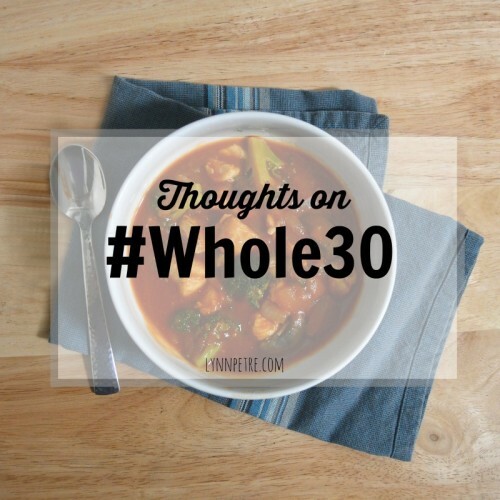 I wanted Whole30 to help me be more mindful about what I was eating and to give my body a reset which is exactly what I got. This exercise has taught me to be more conscious about what I’m eating; reading food labels in preparing for Whole30 was eye opening as to what is included in the pre-packaged foods or sauces I love. It’s astounding how many foods have added sugar or are chock full of sodium! If you break the rules in Whole30, the program suggests the participant restart their 30 day count. I won’t be restarting my count back but I am planning to move forward mostly eating per Whole30. Striving for the healthiest, least processed option will continue to be something I do. I’ll continue to keep gluten and dairy in my diet to a minimum and will cut back on alcohol consumption because it just feels better that way. But I am not going to beat myself up if I go out for a burger and fries on a Friday night or bake a pizza at home on a busy week night. To be honest, I was kinda over it last week. I’m pretty tired of eating the same ingredients over and over and I’m tired of having to clean up an entire kitchen several times a day. And yes, these are both totally within my control – I can research new recipes and I can do better meal prep ahead of time. Last week was crazy with work so I just stuck to what I knew (scrambled eggs for breakfast; sausage + mustard + kale salads for lunch; simple meat + veggies for dinner) which I’m sure is a big part of feeling bored. This weekend, I made this Cincinnati Style Chili recipe and it was legit. Alex, always skeptical of DIY Skyline recipes, said it was the best DIY Cincinnati Style Chili he’d had and I agreed – Mel Joulwan nailed it! I ate mine with spaghetti squash, Alex ate his with pasta and cheese. And while I didn’t add cheese to mine, I really wanted to – not because I am fiending for cheese but because I *know* cheese in Cincinnati chili makes it better. I’m looking forward to Day 31 when I can choose to add cheese to my food again if I want to. The other thought I’ve been mulling over this week is that this is likely the longest I’ve gone without having an alcoholic drink since I was 18 or 19. (I mean, since I was 21 if your name is Sandy and you are my mom.) Not in an OMG alcoholic! way but in my adult life, Alex and I usually have a 6-pack of beer in the fridge and some weeknights and most weekends, I enjoy a beer with my dinner and/or Alex and I will meet up with friends at a bar. I’m rarely getting drunk these days in my old age but I do enjoy hoppy IPAs a couple/few times a week. So I’m sure my liver is really enjoying this little break and, while I do miss beer or a glass of wine with my meals, I’m thinking I can probably drink a bit less going forward. I’ve been replacing my weeknight beer with hot tea and it’s really nice, actually – gives me something to sip while I wind down, is hydrating and has 0 empty calories. I learned an important lesson on Saturday during my long run; what you eat the day before and morning of a long run/workout is wildly important. Duh, right? As I mentioned, it’s been a while since I’ve been in the long distance running game but I should have known better. I did not eat enough carbs on Friday night but still assumed I could go out and run have a strong run…wrong-o. I felt like I was running through cement the entire time and frequently got light-headed. Will definitely be planning ahead better this week! So, 15 days down, 15 more to go. I already have a few new recipes picked out to make this week so hoping for less food boredom over the next 7 days! 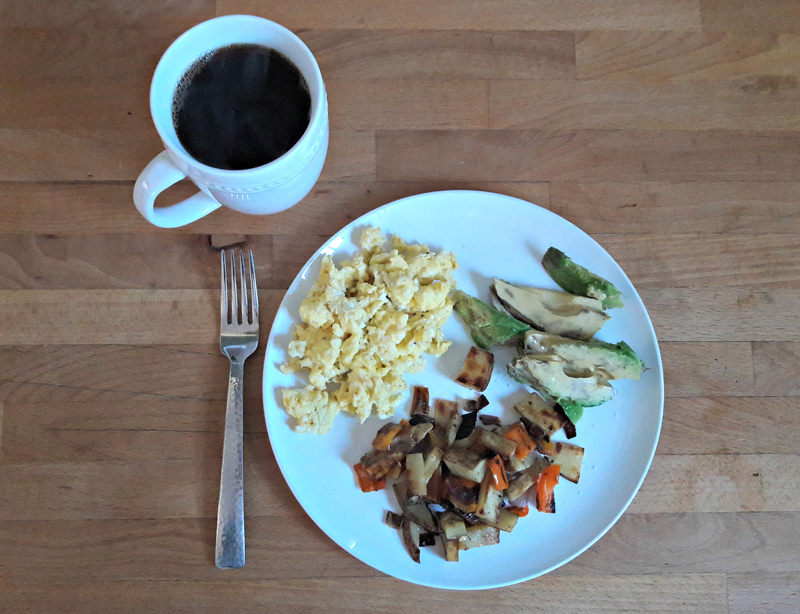 Last Monday, I officially started my first ever round of Whole30. 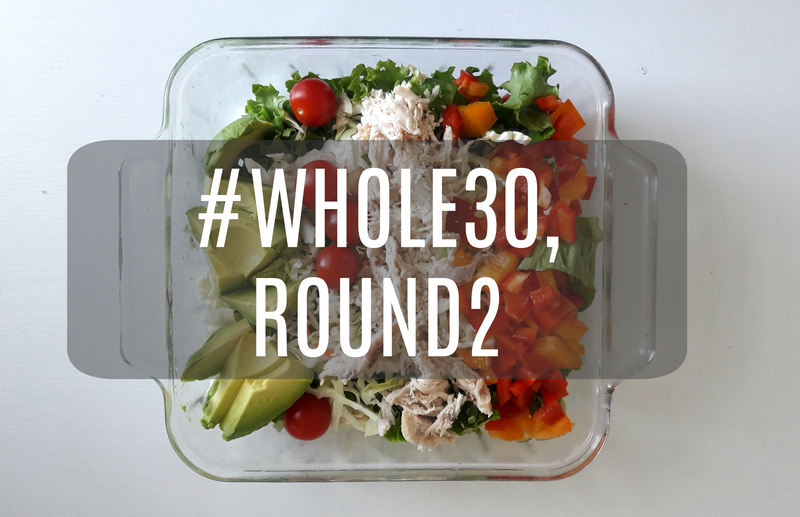 For those not familiar, per the website, Whole30 is a ‘nutritional program designed to change your life in 30 days. Think of it as a short-term nutritional reset, designed to help you put an end to unhealthy cravings and habits, restore a healthy metabolism, heal your digestive tract, and balance your immune system.’ (source) The plan cuts out dairy, gluten, added sugar, alcohol, legumes and encourages high-quality meats, veggies, eggs and other Whole30 approved ingredients. At the suggestion and encouragement of my friend Gretchen who started a #RunningWhole30 community group, I decided to look into the plan. I’ve been looking for a ‘reset’ for a few months (isn’t everyone, after the holidays?) and after reading the book, I understood the science/reasoning behind it. I picked my start date, January 18th, so that I could enjoy alcohol at a MBA school party a few days prior, and created a mini-meal plan for my first week. Reference the Timeline. But don’t hold yourself to it. I’m a gal who doesn’t have a sweet tooth and I also don’t eat much dairy or pasta/breads so I didn’t go through a lot of the hangover/kill all the things emotions. Yay! But it also made me question if I was inadvertently eating something I shouldn’t be. Nope! Just not having a severe reaction – and that’s kosher! Enjoying to cook. I’m learning to enjoy cooking and this past week has really helped further this. 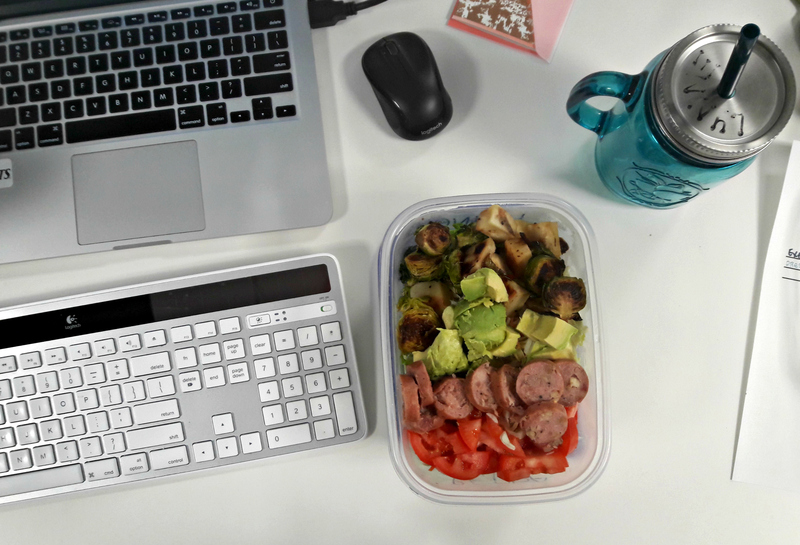 There aren’t many grab-and-go options for Whole30 so the plan requires a lot of cooking and meal prep. I’ve never been great about these things (because I don’t like to plan or prepare ahead) but I’m getting the hang of it and enjoying cooking. Although, I do wonder if my simple meal tastes good because I’m hungry? Or because I did a good job cooking? Tired of cooking. As much as I’m enjoying cooking, I’m also really tired of it. It requires much more thought and attention than I’ve ever put into my meals before. With the limited free time I have in a day, spending it thinking about how I can make a Whole30 compliant meal is not how I’d choose to use it. It gets easier. Last weekend, I spent an absurd amount of time researching what is/is not allowed, pulling recipes from the internet and browsing the aisles at three (3!!) grocery stores to find compliant ingredients. After 7 days in, I feel like I have the hang of it and feel less stressed about being 100% ready to go on Sunday night. (Which is good because I opted to ski yesterday instead of meal plan!) The point is, once you get a few days under your belt, it’s easy to figure out what you like/don’t like, what can be paired together, how to make breakfast better (add breakfast potatoes! ), etc. I know that I really like to eat sausage with spicy brown mustard, kale/salad and fruit for lunch and until I get tired of it, I’ll keep eating it. One day at a time. Right now, 21 days feels really, really far in the future but I know it will pass quickly. My mentality is to plan to be Whole30 compliant for today and only today…for the next 21 days. After skiing yesterday, I was really grumbly about not being able to warm up with a burger and a beer after I was done (it’s practically tradition!). But instead, I went back to my car and ate a banana I’d brought for the ride home. Womp womp. But I’d told myself in the morning to make Whole30 choices that day and that day only. I have pretty strong willpower but in situations where I’d rather not eat Whole30, I remind myself it’s just for today. So! 1 week down, 3 more to go. According to the timeline, day 10-11 are days people feel most like quitting (that was me, yesterday) but I’m committed for the long haul. And I’ve got a delicious pork loin cooking in the Crockpot so Day 8 will be a breeze. Onward and upward! It seems as though kale’s 15 minutes of internet fame might be winding down but, fortunately for the kale industry, my consumption has not waned. I never got into the fancy kale recipes but did find a massaged kale recipe that I will never stop eating. It’s simple, delicious and takes 30 seconds to make. The hardest part of this recipe is cutting up the head of kale… and I’ve started buying pre-cut kale to make the whole process even more brainless and efficient. Add to a large bowl and drizzle olive oil, a squeeze of lemon (usually 1/2 of a full lemon or a healthy squirt from a lemon juice bottle) and a few cranks of sea salt. Be sure your hands are clean and then get to work massaging those leaves. Massage kale for ~1-2 minutes; kale volume will reduce in size, usually by about half. Add additional lemon and/or salt to taste. Portion out into serving bowls (or eat right from the bowl!) and enjoy! Option to add toppings – get crazy! In this instance, I added crushed peanuts from the pad thai we made for dinner that night as well as leftover cilantro we had in the fridge. Now that I buy the pre-cut kale, I make single portions at a time more often but when I bought kale that needed to be cut, I would massage the entire batch of kale and stored in a Tupperware in the fridge; the salad keeps well for a few days. First things first, I don’t often have a sweet tooth but when I do, I usually want either a chocolate chip cookie or a brownie. The craving struck last weekend and I couldn’t get brownies off my mind. So I did some googleing; I decided if I was going to try a new recipe, why not try a healthier recipe? I have chocolate Designer Protein powder in my pantry so surely there was a protein powder recipe, right? 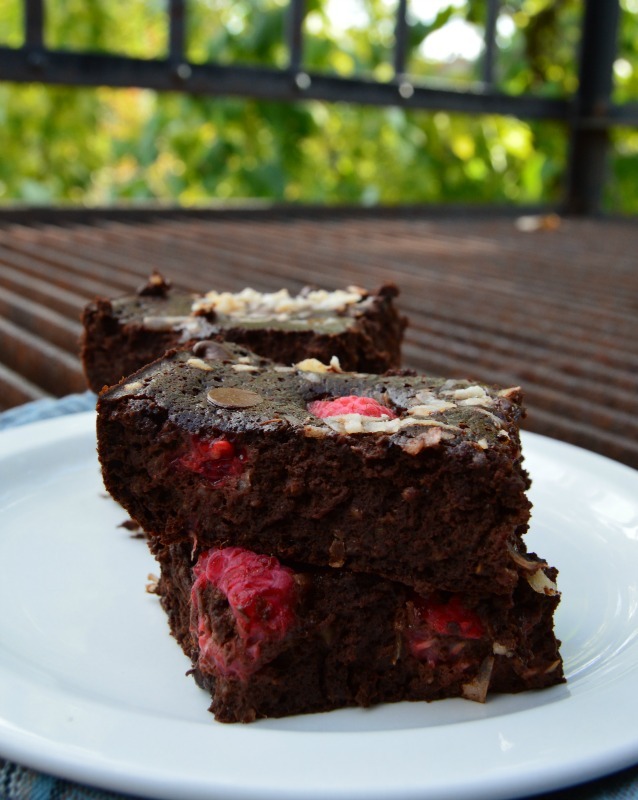 Well, as it turns out, there weren’t as many protein powder brownies on the internet or on Pinterest as I expected (or, you all now know that I have subpar googling skillz) but I found a recipe from Ambitious Kitchen (here!) that fit my bill and promised to be delicious. I gathered my ingredients and set to work during halftime of the Bengals game. I started and finished these brownies and popped them in the oven and the sportscasters were still chitchatting about the first half, that’s how easy these were! 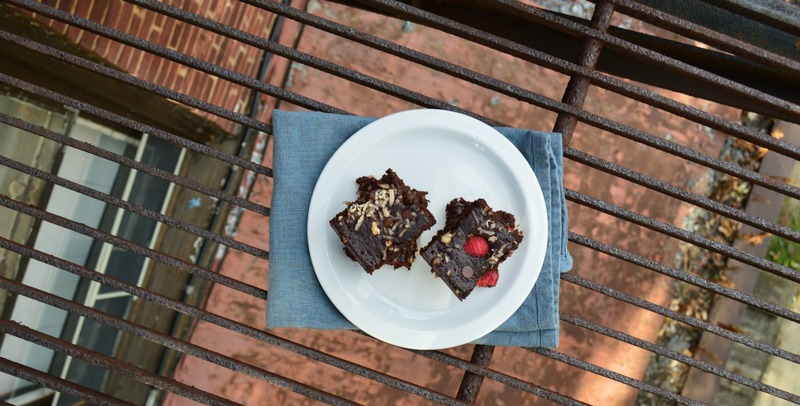 Of course, what’s a new recipe without two thumbs up from the sweet tooth in the house? Not a recipe that makes it to my blog, that’s for sure. Alex and his friend took a break from football (err, studying Managerial Economics) to give these a try and both nodded in agreement, this recipe is a keeper. Preheat oven to 350*F and spray 8×8 inch baking pan with nonstick cooking spray. Using a blender or food processor, blend oats for a minute until it resembles flour. Move flour to a medium/large bowl and whisk in protein powder and cocoa powder; set aside. Whisk applesauce, egg, honey, vanilla and cashew milk until well combined and smooth. Add wet ingredients to dry ingredients and mix together until just combined. In a small saucepan, heat coconut oil and chocolate chips over low heat, stirring continuously. Once completely melted, gently stir into brownie batter. Pour mixture into 8×8 pan. Sprinkle small handful of chocolate chips and coconut flakes on top of the mixture; add raspberries to the batter (I placed whole raspberries in the batter but you could also cut into pieces and sprinkle on top). Bake for 18-22 minutes or until the age old knife test says these are done baking. Set aside to cool. Once cooled, cut into 12 pieces and enjoy! Recently, I wrote about my love affair with massaged kale salads. I even forced my family to try it last week on vacation and converted a couple non-believer siblings! Unfortunately for my husband, though, kale salads just aren’t this thing. Also unfortunately for my husband, I am not the most creative person in the kitchen. I am really good at making 2 or 3 dinners and don’t usually stray too far from my standbys. But the other night, I knew he’d be working late and I wanted to surprise him with a tasty dinner when he came home. With only kale and chicken as my ingredients, I knew I was in trouble. If it were up to me? I would have made that kale salad and grilled the chicken and enjoyed them separately but equally. I knew Alex would want something a bit…more interesting. At a loss, I emailed ladies who know a lot more about food than me (hi Val, Marisa, Lauren, Tiffany!) and they came to my rescue. I wound up with eight (EIGHT!!) dinner ideas for wowing my husband with chicken and kale. Admittedly, I picked this recipe because I had most of the ingredients already and it looked the easiest. Not only was it super easy to make and took not very much time (two key requirements in my cooking endevours), it was such a fabulous meal! I could not believe how frickin’ awesome this tasted. Usually my food turns out decent but never zOMG SO GOOD. This, though, is zOMG SO GOOD. I was pretty proud of myself – so proud of myself that I tried to take real food photos so I could share this supidly easy and awesomely flavorful recipe with the internetz. When my foodie husband told me it was on par with my favorite pad thai he makes, I knew this recipe made it to the big time in the Petre Kitchen. De-stem and wash kale; chop into small strips. Bring a pot of water to boil, cook spaghetti as directed; drain pasta and set aside in a large bowl. Cook chicken in large saute skillet with a bit of olive oil and salt and peper, to taste. Once chicken is cooked, remove from pan and set aside to cool. 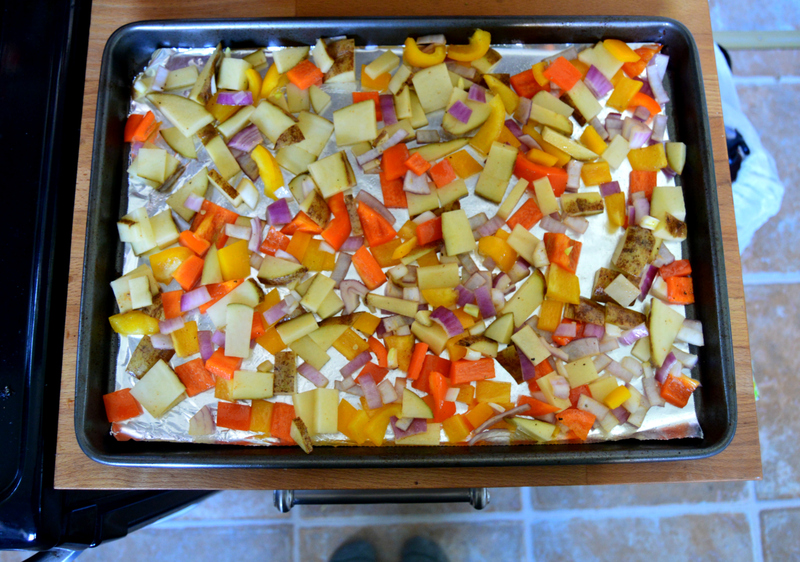 Once cooled, cut into bit sized cubes. In same pan, add a bit more olive oil and bring pan to medium heat if cooled. Add garlic and onion; saute for a few minutes until slightly brown. Add chopped kale; cook for a few minutes or until kale is completely wilted. Add kale, garlic and onion to cooled pasta. Add tomatoes, pine nuts, juice of lemon half and chicken. Toss/mix well. Top with fresh, shredded Parmasean cheese.